When I entered the insurance industry as an adjuster trainee in the 1980s, I quickly learned that the industry was complex, and the perspectives I had as an insurance consumer were not in line with the realities of the insurance business. I was fortunate to have a manager who believed strongly in industry-specific training and offered guidance on the various programs available – instilling a culture of continuous learning in my department. From that first insurance role until now, education has continued to play a critical role for me professionally and has remained a competitive advantage for the companies where I have worked. In my current role at I-CAR, I have had the opportunity to work with numerous insurance and collision repair facilities to understand their unique challenges and identify how training programs can address these challenges, particularly in today’s environment of constant change. While insurers and collision repair companies are commonly perceived as being on opposite sides of the table, they in fact have more commonalities than differences, including the need for well-trained, qualified professionals and embracing continuous learning. Both industries are facing talent shortages. Roles within the insurance industry are evolving quickly and require an influx of staff who can keep up with the number of retiring employees, while growing to accommodate increased needs. Similarly, the collision repair industry is in need of qualified entry-level technicians. There are specific programs designed to increase the talent pool of qualified candidates for these hard-to-fill collision repair positions, such as the Community College Skilled Trades Equipment Program in Michigan, which provides grants to schools that benefit high-demand occupations like auto body repair, and Fayetteville Technical Community College’s two-year program in North Carolina, which focuses on graduating knowledgeable technicians. And there are more like these. Yet, the challenge to fill open jobs nationwide continues. As more automakers integrate new materials, technologies and designs, there is an increasing need for insurers and collision repair technicians to learn different skill sets to ensure vehicles are properly and safely repaired. Skills such as welding for both steel and aluminum are becoming more important as a tsunami of new vehicles comprised of new, advanced and mixed materials are currently entering the market. While welding is one of the most dramatic changes, additional knowledge and new skills are required. Understanding topics such as vehicle parts and terminology, reading damage reports and repair and refinishing processes builds a strong foundation for continued growth and career advancement. It should come as no surprise then – given the number of new employees and ever-evolving technical knowledge and requirements – that training tools and access to OEM repair procedures are in critical need to provide complete, safe and quality repairs. Similar to my early personal experiences, many insurers today have embraced a culture of learning, encouraging training for network collision repair shops because they believe in and recognize the value of ongoing education for their own workforce. For insurers, it is more than just meeting a requirement. It is about being proactively prepared to address a changing industry. Training can be an especially beneficial tool – particularly when combined with on-the-job experience – to help prepare insurers’ expanding workforce. Insurer USAA completed training for 100 percent of its Auto Physical Damage Appraisers by achieving the Platinum ProLevel 1 designation for ongoing, role-relevant training from I-CAR, and State Farm achieved 100 percent APDA training in I-CAR’s 2015 Ford F-150 structural repair course. 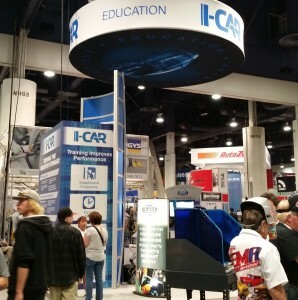 Other carriers are working with I-CAR to develop hands-on programs for their APDAs – above and beyond I-CAR’s traditional Professional Development Program training. To date, 317 total insurance locations have achieved the Insurance Gold Class business designation – the industry standard for collision repair training – which includes 36 Corporate Gold Class members representing 272 locations. There are 5,424 Platinum APDAs which represents approximately 19 percent of the Insurance APDA population. Beyond I-CAR’s core PDP curriculum, many insurers (and collision repairers as well) are also utilizing I-CAR’s “Intro to Collision Repair” series which provides an understanding of fundamental collision repair business processes. Each of the 14 training modules can be taken individually or collectively as part of the series, making it easy for human resources professionals to build a program that integrates seamlessly with existing proprietary training programs. Training can be hard work – but we should be making it work for us as insurance carriers and collision repair facilities. An investment in a “Learning Culture,” with the help of training tools designed to address industry challenges, can break down silos that often exist between insurers and collision repair facilities, and help to bridge the gap and improve relationships between appraisers and repairers. Training can also serve as a common language, providing a common base of knowledge. If insurers and collision repair facilities are investing in the similar training programs, such as I-CAR, it can help build a sense of community – helping both sides. It can also lend itself to better collaboration, recognizing that repairers are the ones that actually perform the repairs. The I-CAR vision is “that every person in the collision repair industry has the information, knowledge and skills required to perform complete, safe and quality repairs for the ultimate benefit of the consumer.” Training of the collision repair inter-industry is key. All parties, including insurance carriers, collision repair facilities and consumers, can benefit. In my experience, training has always had value, and will continue to influence the insurance and collision repair industry’s readiness to take on increasingly complex collision repairs. Only by proactively looking at training as a key business process, and a way to ensure future success, can insurers and collision repair facilities fully recognize the benefits of training. Training should not just be another box to check off – it’s an opportunity to collaborate, improve and recognize efficiencies for everyone involved in the collision repair process. Elise Quadrozzi is the director of business development at I-CAR.